What should the reigning princess of the day carry? A crystal scepter, of course. On her Quinceanera, a young lady is going to feel like queen for a day. You can ensure that she looks that part. These silver-plated scepters are just the thing. The large scepter measures 14" in length. 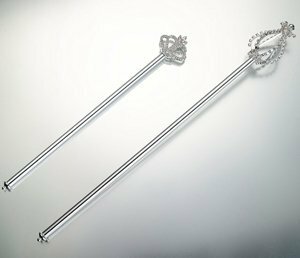 The head of the silver tone scepter is decorated with an easily recognizable crown shape. It's done in crystal clear rhinestones. The Crown Scepter is longer at 19" and head of the silver tone scepter is decorated with a 3-dimensional crown shape. It's also done in crystal clear rhinestones. She will look regal as she enters the room for her big dance. She'll always keep it to remember how wonderful it felt to have a party and be the guest of honor. Surprise her with this lovely accessory to complete her already dazzling attire.